Tim works for a temp agency and is assigned an HR job at Super Crises International (SCI) for a few weeks. It’s an agency that deals with crises of the super variety, and like any big agency it has its corporate red tape, line-towers and disgruntled employees. SCI has its share of that and then some. Poor Tim's first day was not what he expected. No sooner had he sat down in the waiting room than a ninja-clad job applicant –– looking to nullify any possible competition –– injected Tim with some paralytic green spinal goo. There is an antidote but it's just out of reach, and so Tim degenerates throughout the agency tour by his boss, Mrs. Nicholas. The story is funny for anyone who has every worked for a company with more than 20 employees and been irritated at the ridiculous amount of unnecessary paperwork, procedures, or the outright rejection of good ideas. We've had other comics and movies in the same vein – DILBERT and OFFICE SPACE. What makes this title different are the monsters, supers, and creatures. Zambor the receptionist –– a Frankenstein-like creature –– is part of the Evil Villain Relocation Career program, and he tolerates very little from anyone including customers. "How may Zambor direct your call, pathetic sack of man-flesh?" We’ve all known that one person who needed firing, for no other reason than hatefulness. The characters are quirky and the comic is a fun read, but it is not really school material. A reader simply needs a lot of real work experience to get SUPER HUMAN RESOURCES. For those of you who need a break and a fun laugh, or a healthy counter to your work environment, this should fit the bill nicely. 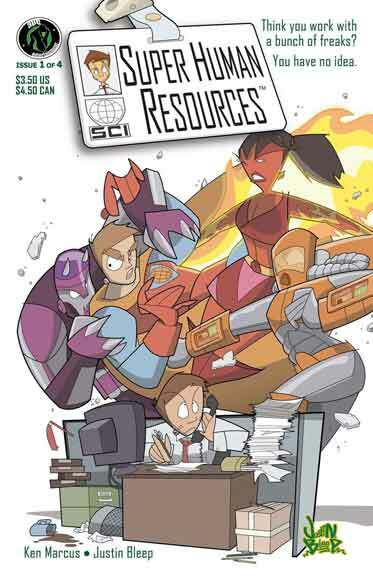 For grown ups who’ve worked and cursed, I recommend SUPER HUMAN RESOURCES. Don’t bother your students with it.